There is no question that the cannabis industry is making a lot of money from a lot of different people and companies. In fact, the medical cannabis and recreational marijuana business has already become a billion-dollar industry. However, there are many aspects of the marijuana business, and much the money is being made from things other than the growing and sale of marijuana itself. One of the increasingly more profitable ventures is the development and sale of what is being called marijuana equipment. While there are still a lot of regulations and legal pitfalls that can get these companies into hot water, the business is doing very well, according to a recent news article from USA Today. Some of the products that have become increasingly popular are home growing units. 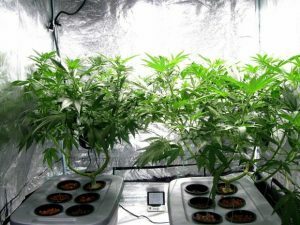 While you can still walk into a hydroponics shop and purchase expensive lights and growing medium and all kinds of other accessories, some people do not want to have a traditional indoor grow operation in their closet, for example. These days, people want to by a high tech box that looks like a futuristic refrigerator in which they can grow marijuana. Not only can they grow marijuana, they don’t need to know all that much about gardening or even get their hands dirty. The machine does all the work and looks like a high-tech piece of equipment, which it is. One such unit retails for $3,000 and is even Wi-Fi ready. This means you can use your tablet or smartphone to track the progress of your growing marijuana plants and can even see them on the included web cam. Over a thousand units of this product have already been sold, and there are others like it on the market. Another product is designed to fill cartridges with medical cannabis for use in vape pens. This company is in Orange County, California and has growing demand for large machines that sell for over $16,000. This demand is only expected increase as more and more states legalize medical marijuana and recreational use of marijuana. However, while there is a lot of money to made when selling products that may be designed for cannabis use across state lines, it is not hard to imagine how a business owner could end up in regulatory trouble or even federal prison. This is not to say that you should not go into the cannabis equipment business, but you should certainly first speak with an experienced Orange County cannabis business attorney before spending any significant amount of money on your startup. While some people are hesitant to spend money on legal assistance too early in the process, and have an attitude of let’s get started now and worry later, this can get you into a lot of trouble. It can also end up costing you and your business a lot more in the long run to fix problems that have occurred than to make sure things are done right in the first place. Additionally, you certainly want to avoid anything that can result in your being arrested.